What is Project Learning Tree? Vermont Project Learning Tree envisions a future where every young person understands, appreciates and loves the natural world, and enjoys spending time outdoors. Our community's future depends on a strong connection between children and the natural world. Research shows that people who enjoyed meaningful experiences in the outdoors as a child, are able to think critically and act responsibly on behalf of the ecological, social, and economic values of our forests and other natural resources as adults. VT Project Learning Tree achieves its mission by training educators in Project Learning Tree®, the time-honored environmental education curricula developed by the American Forest Foundation. 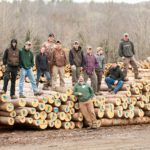 VT Project Learning Tree relies on the support of every facet of the community--businesses, individuals and government--to accomplish its mission.